After sorting out tracking issues, in a race against the rapidly dawning sky on Thursday morning meant that it was only possible to capture 8 x 10s exposures of the Swan nebula before the sky became too light. A ZWOASI120 MC camera was placed at the prime focus of an f/5.5, 80mm ED refractor and TIFF images were captured using AstroDMx Capture for Linux. 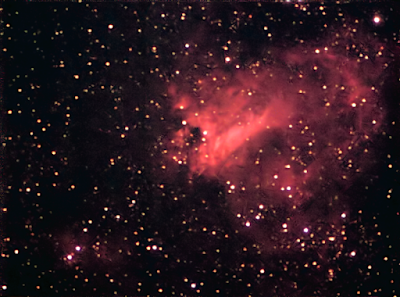 The captured images were dark-frame corrected and stacked in Autostakkert! 2.6 and the resulting image was post processed in the Gimp 2.9, Neat Image and delaboratory post processing software.